Zenith continues to operate from the same site in Le Locle where the company commenced its operations back in 1865. The brand was founded by Georges Favre Jacot. The vision of Georges Favre Jacot was to bring together all the trades necessary to produce watches and base them in one location. The centralised and serial production of watches, unusual in 1865, conferred benefits in terms of quality control. Indeed, Zenith watches earned an enviable reputation for the reliability and precision of its timepieces. Such was the exceptional precision of Zenith watches that they won many prizes in chronometric competitions. Over the years, Zenith grew, occupying a greater amount of the neighbouring land with additional buildings. The design of the buildings paid due consideration to working practices, ensuring the production environment was conducive to the creation of fine watches. The original Zenith buildings continue to be used today and remain striking with their red and white brick walls. Large windows bathe the production areas with essential natural light. The premises continue to prove ideal for the creation of timepieces but are also historically significant. The architectural importance of the buildings, home to the early industrialised production of watches, has been recognised by UNESCO and are listed on the World Heritage List, together with the cities of Le Locle and La Chaux-de-Fonds. Throughout its history, the chronograph has been a complication synonymous with the maison. Zenith released its first chronograph in 1899, however, its most iconic chronograph remains the El Primero introduced in 1969. The year 1969 proved to be an interesting period for the watchmaking industry as a whole with three other companies, along with Zenith, developing self-winding chronographs. Heuer collaborated with Breitling to produce the Calibre 11 and Seiko revealed the Calibre 6139. Each company continues to talk about being the ‘first’. Both the Seiko and Zenith movements were fully integrated, while the Calibre 11 was a modular design. The El-Primero was unusual for another reason, it featured a balance oscillating with a high frequency of 36,000 vibrations per hour (5 Hertz). A key benefit of this high frequency is that it allows split-second timing to the nearest tenth of a second. The early 1970s represented a dark period for the Swiss watch industry with the advent of the quartz movement in 1969 threatening the domain of the mechanical watch. Several watch companies ceased trading. Machines and movements were discarded, being considered obsolete. The perception at the time was there would be no future demand for mechanical watches. Even to this day, individuals who worked in the watch industry during the early 1970s talk of the catastrophic impact of ‘the quartz crisis’. 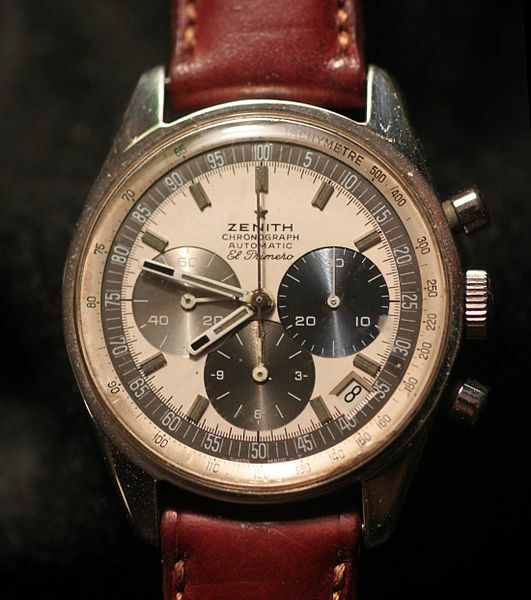 In 1975, Zenith, owned by an American company at the time, received a mandate to cease production of mechanical watches and focus solely upon the manufacture of quartz watches. Instructions were also received, stating that all machines, parts and tools should be sold by weight to the highest bidder. At the time, an employee of Zenith pleaded with the American owners not to discard the means of producing mechanical watches, but his requests were ignored. Charles Vermot, a watchmaker at Zenith took the bold decision to ignore the American owners and hide the parts, plans, plant and tools for safe keeping. In 1984, after mechanical watches began to enjoy a renaissance, Vermot returned the various items he had secretly stored for nine years to Zenith. Shortly thereafter, the production of the El-Primero recommenced. Several other brands procured the movement, including, most notably, Rolex for its Daytona model. Zenith was acquired by the luxury conglomerate, LVMH in 2000 and the El-Primero now features in some models belonging to its sister companies: Bulgari, Hublot and TAG Heuer. While Zenith continues to make other movements, including remarkable tourbillons, it will forever be associated with its legendary El Primero chronograph. The high frequency of the movement, the silky-smooth operation of its push pieces and its commendable finishing are just some of the attributes which make the El-Primero loved by legions of watch collectors around the globe. Browse Blowers’ selection of Zenith watches online today.